I have recently shrank the size of a Cassandra cluster from 24 m1.xlarge nodes to 6 hi1.4xlarge nodes in EC2 using Priam. The 6 nodes are significantly beefier than the nodes I started with and are handling much more work than 4 nodes combined. 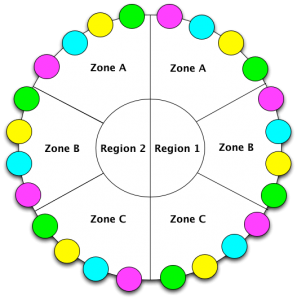 In this article I describe the process I went through to shrink the size of our cluster and replace the nodes with beefier ones without downtime by not swapping each node one at a time, but by creating an additional virtual region with beefier nodes and switching traffic to that. 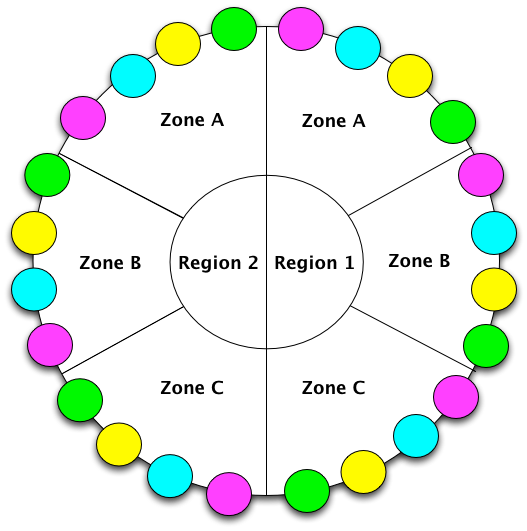 The NetworkTopology of the cluster was like the figure above. You may have a different replication factor or may not have multi-region; it does not matter. Since Priam doesn’t have the cluster shrinking built into it, I decided to go with the second option. 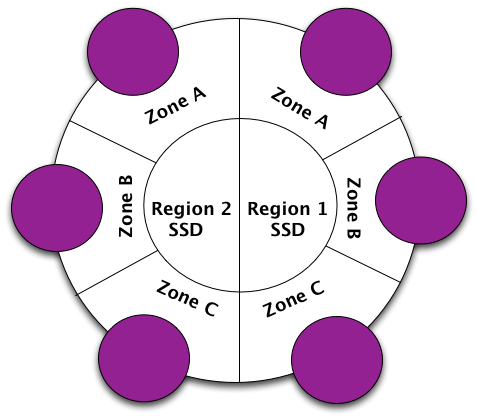 This provided me with a clean slate cluster acting as another datacenter (in Cassandra terminology) in the same AWS regions as I had the existing cluster. This way, I could evaluate the health of the new 3 nodes before having them serve traffic and the cleanup process of the old nodes would have been fairly simple. In this method, I utilize the patch in CASSANDRA-5155 to add a suffix to the name of the datacenter in the new cluster. 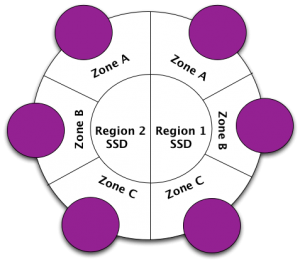 In this article, I described how I migrated a large cluster to fewer nodes without downtimes using a patch I have added to Priam. My approach was focused around minimizing impact on the live traffic while we were doing this. You can get the updated Priam code from GitHub.